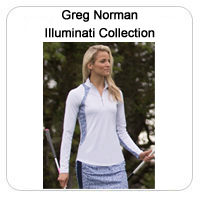 Greg Norman Women's Apparel Collection is a leading distributor of golf-inspired sportswear and accessories targeting active, sophisticated women. 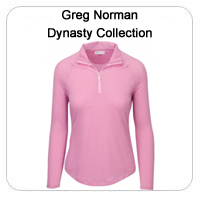 The Greg Norman Ladies apparel's moisture-wicking innovative Play Dry® technology and unique combination of performance, luxury, and style continue to differentiate the brand. 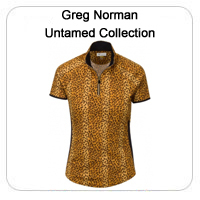 Good golf performance can be perceived as an excellent golfer, luck, or you being relaxed and comfortable in your Greg Norman golf clothes. Lori's Golf Shoppe gives you the opportunity to select from a fabulous collection of golf attire. 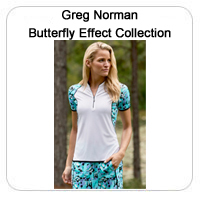 Manufacturers such as Adidas, Cutter & Buck, EP Pro, Nancy Lopez, Nike, and many more will have you decked out in the best golf fashions money can buy.